I am English and I visited Utah about 30 years ago, after that I was hooked on the American way of life especially the animals. I could not believe the amount of people that owned horses; you have to be really rich in England to own one! After visiting, I decided that I would like to live here. My Dad was an American, which should have made it easier, but it still took me three years of red tape to get here! That was 16 years ago and I love every minute of my life now! I started raising Boer goats about six years ago. My husband Clark and I started with a commercial herd and then gradually changed to full bloods and showing. When I first started I knew nothing about raising goats and the first year kidding out was quite over whelming! I think we had 100 kids born in two weeks in the middle of January. I remember one of the first difficult births. I was on my knees looking at this little kid hanging out of its mom, with the phone in one hand taking instructions from a seasoned goat breeder and trying to pull out the kid with other hand. That seems like a long time ago, and now I am on the other end of the phone helping other new goat breeders! As I got more involved in the goat industry, I noticed that there are a lot of goat breeders in Texas and the surrounding states, but few in Western Colorado. So, with the help of a few other goat breeders and friends in the area, we decided to rally some interest here in Colorado. That’s why we started the Firecracker sale and jackpot last year. Our first jackpot show and sale in 2010 was a big success. I have noticed that families that show goats tend to be closer, and it is so nice to see the kids out in the show ring instead of out on the streets being subjected to all sorts of potential dangers. The Boer goat industry is something that anyone of any age can participate in. There are numerous opportunities for kids and families to become active in the Boer goat industry. Young people can become active in the International or American Boer Goat Association as well as 4-H and jackpot shows. Mom, Dad, Grandpa and Grandma can also participate by showing in the IBGA or ABGA sanctioned shows at any level. 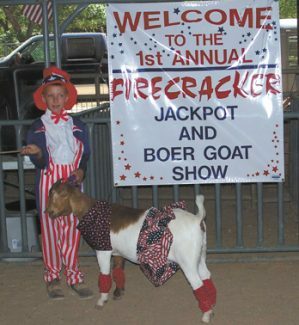 We started the Firecracker seminar and sale to help educate families new to the Boer Goat breed. The Firecracker is meant to be a place where kids can come and purchase quality animals, learn how to take care of that animal, and then have a fun opportunity to show that goat later in the summer. Prior to the sale there will be numerous chances to learn about Boer goats. We will have representatives from Ranch-Way Feeds to present information about feeding programs and management tips. Katie Sinclair does a great job relaying the information to the kids and parents; she even hands out informational packets so you don’t have to memorize everything! I will give a demonstration on hoof trimming. I am so surprised at the amount of people that don’t know how to trim hoofs properly. I will also be doing a demo on pregnancy checking using a Renco Preg Tone. If you have a doe that you would like to have preg checked and she is 30-90 days bred, please feel free to bring her along. This demonstration will be limited to the first 10 goats, so call if you would like to be part of the demonstration. These seminars are important to educate the new goat breeder and kids that want to get into showing for the first time. On April 9, there will be a tremendous opportunity to choose from a great selection of quality market goats from top wether producers in the Western United States. All of the goats in the sale will be sifted for health and show standards prior to the sale. We think that this gives kids a unique chance to get a quality show animal without worrying about quality. We want all of the kids that purchase goats from the sale to have fun showing goats and to have a good experience! After the Firecracker market goat sale there will be a small breeding goat sale made up of select doelings, does and a couple of bucks. Animals purchased from the sale would be great for breeders that want to expand their genetics and to improve their herds. These also will be sifted for faults and health issues. Only prospect market goats that were bought from the Firecracker sale on April 9 will be eligible to enter the two $1,000 added money jackpots. Kids who bought prospect wethers in April can win $1,000 in added money at the jackpot on July 2 at the Firecracker Classic Show at the Mesa County Fairgrounds in Grand Junction, Colo. Because of the success of last years show, there will also be a sanctioned American Boer Goat Association show on July 2. The second chance to win $1,000 will be on July 16 at the Chili Pepper Show in Farmington, N.M., at McGee Park. Both of these events will also have an open jackpot show. So, mark your calendars for the Firecracker sale on Saturday the 9th of April. As an added bonus after the ABGA show on July 2 we will be having a breeding goat sale for people who would like to get into showing registered animals at ABGA/IBGA shows. All of the goats in this sale will come from proven herds with an excellent show record. These goats will be of show quality and some of them will be shown on the day in the ABGA show. You can go to http://www.KickinARanch.com to view the market and show goats for sale and to view the on line catalog page. If you have any questions please call Erica Ashby at (970) 234-9229 or Natalie Pruitt at (505) 334-0129.